Town with 7,300 inhabitants on road No. 64, only 8 km from Lake Balaton. The Calvinist church was built from 1789 to 1792 on the site of the former earthwork of the Török family. The Roman Catholic church was built by Prince Fülöp Batthyány between 1838-1840. The Classicist Batthyány castle houses an ambulatory clinic at present. Outstanding events preserving the traditions of the town: Whitsuntide merry-making in Balatonbozsok, Organ Music in Summer Evenings, Musical Castle Garden, programmes on Saint Stephen's day, Vintage festival, Török Bálint Days of Enying, Vintage merry-making. Thew village is 7 km south of the Lake Balaton parting of M7 motorway. 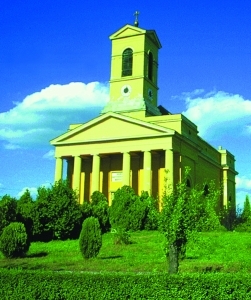 Roman Catholic church, built in neoclassical style in 1838.